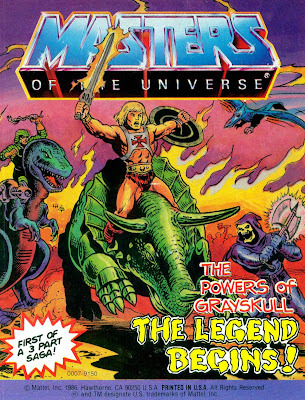 The Powers of Grayskull – The Legend Begins! is a 1986 Masters of the Universe mini-comic written by Phil White and illustrated by Larry Houston and Bruce Timm. Here, He-Man and Skeletor journey to Eternia’s past, where the Snake Men are using bionic dinosaurs to oppress the villagers. As the cover indicates, this was intended to be the first of a trilogy leading into Mattel’s The Powers of Grayskull spinoff featuring the wizard He-Ro. But parts two and three were never made, and the three dinosaur toys, the vanguards of the Powers of Grayskull line, were the only toys ever produced with that branding. It’s too bad; it would have been great to find out how, exactly, ancient Eternia has all these cyborg dinosaurs, and it’s a lot more appealing than the ponytailed He-Man-in-space we got in 1990. The story here is noteworthy primarily for the contributions it sets itself up to make to the mythos; otherwise, it’s little more than a big fight scene featuring the three dinosaurs (two of which, interestingly, aren’t named (or spelled) in accordance with their toys). Also of note is that there’s a Cosmic Key reference here to tie in to all the movie shenanigans (the prospect of trying to bring aspects of the live-action film into canon is a dubious one, though). The art is a highlight – Timm only provides the inks, but he makes the illustrations his own, as his style is apparent on every page. The dinosaurs are all nicely done. The Cosmic Key yet remains for us, but this is truly the last real mini-comic. It’s not one of the greats, but it leaves us wanting still more – and really, what else could we ask for?